The beer-brewing company Beck's is well-established as a sponsor of contemporary art events. 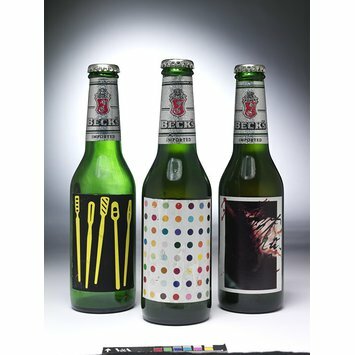 Since 1985 they have commemorated their major sponsorships and exhibition openings by inviting artists to create limited edition labels, in order to identify their brand image with the perceived attributes of contemporary art - cool, original, young, irreverent, controversial and talked-about. Each label offers us a miniature ‘snapshot’ of the artist’s characteristic style and subject. 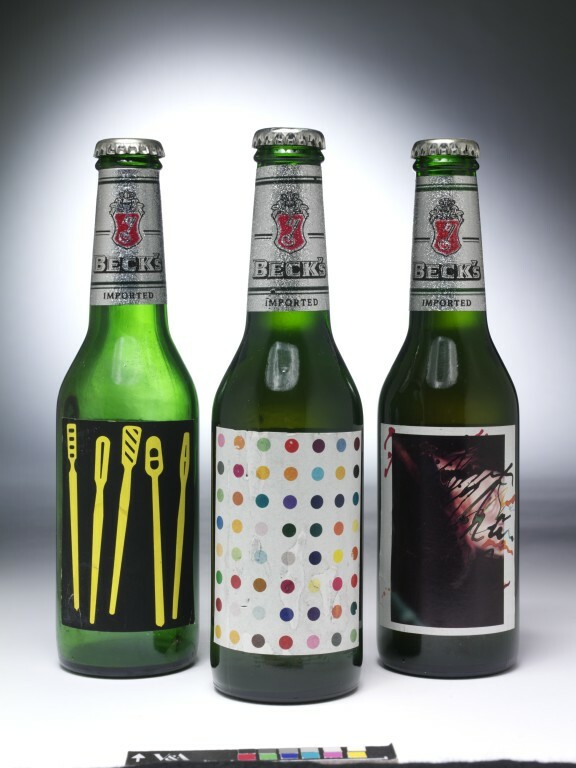 Some are instantly recognisable, such as this one showing by Damien Hirst with the coloured dots which are familiar from his spot paintings; this is one of two labels he designed in 1995. Other examples in the V&A collection are by Tim Head and Rebecca Horn.